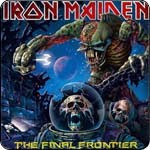 With millions of fans all over Earth, Iron maiden\'s next tour destination is space (the final frontier). En route to the second leg, fierce Space Pirates attack and destroy the band\'s cargo ship, scattering equipment across the galaxy! Piloting Ed Force One (a space shuttle version of the band\'s customised Boeing), players must retrieve enough cargo from each of the five levels for Iron Maiden to perform the loudest gig in the Universe! Picking up instruments and sound equipment with the shuttle\'s grappling hook is the easy bit. Each piece affects the manoeuvrability of your space shuttle, and planets, space stations and asteroids all exert gravity fields. Then there are the persistent Space Pirates to dodge and fight, and a variety of things to collect such as health, shields and fuel. Collecting the 10 letters of the Iron Maiden name increases players\' scores and unlocks exclusive Iron Maiden wallpapers to download.